The original and still the best – Casio’s MG-880 was released in August 1980 and began a decade of integration of calculators and games for the Casio company and its competitors. Kids lucky enough to have this amazing toy could happily charge their classmates to play, although not having a volume control or mute button meant games were confined to break time and lunch, where the player could expect to be surrounded by admirers ready to applaud or scorn his ability. It was rare to see the MG-880 actually used as a calculator, so fun and addicting was the digital invader game. It was as close to space invaders as you could get without any graphics apart from the numbers available on an LCD screen, so was dubbed the ‘space invader calculator’. Such was the success of the MG-880, Casio duplicated it in several forms – the MG-660, MG-770 and MG-890 calculators (each different in their own right, but sharing the same game), and in watch form in the QW134 module – CA-85, CA-851, CA-86, CA-90, CA-901 and updated models CA-53 and CA-503 with the QW433 module. Still fun to play many many years later – just like the original space invaders!! 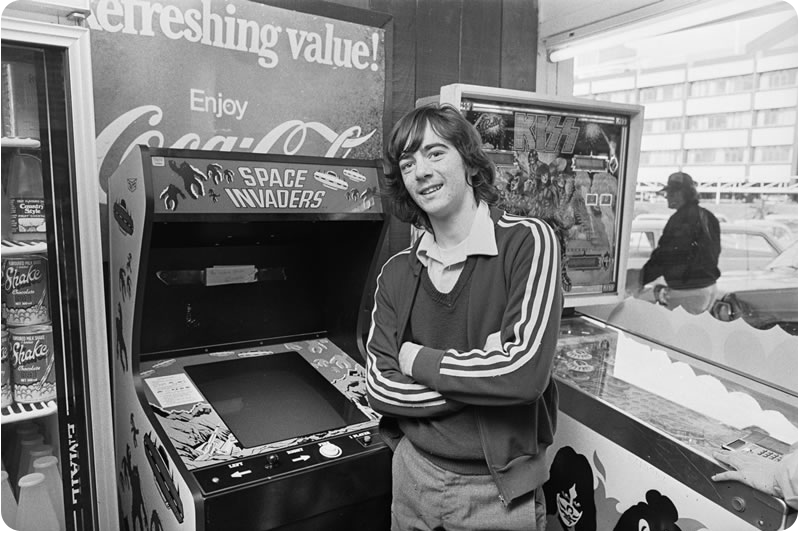 UPDATE: I found this excellent photo of a bloke leaning on a Space Invader machine / Kiss pinball, circa 1981. Most interesting though is what’s happening in the bottom right corner – see that calculator? Even with video games and pinball machines nearby, the MG-880 was still getting some love!! See more of these photos from the early days of New Zealand’s pinball and video game awakening here. 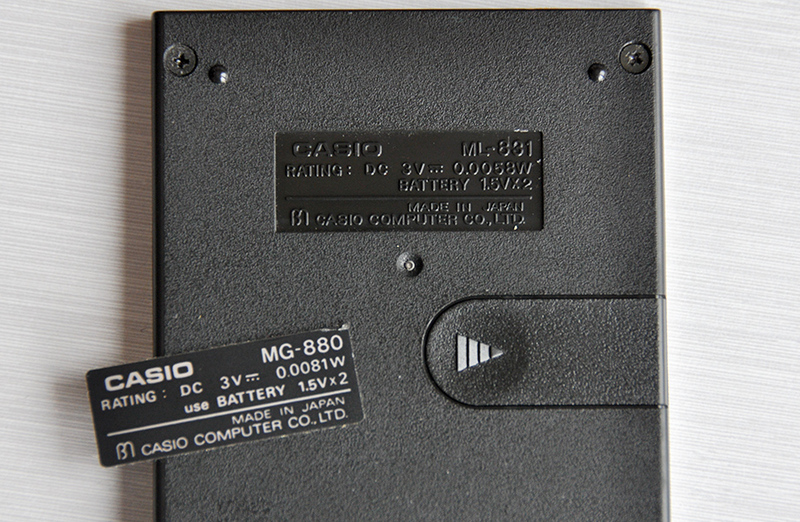 I was repairing a FX-880 and discovered something interesting; Casio had used a different calculator for the caseback and had just stuck a sticker over the top. Why would one have a sticker and one not…surely they are both the same…? The MG-880 had a ML-831 caseback. There’s no doubt there will be other calculators like this and I’m guessing it’s because one model wasn’t selling well and the other was selling better so they thought they had better use up existing stocks of cases. If anyone can shed more light on this though…let me know. I’m not selling any more MG-880s from this site currently. Please check www.trademe.co.nz or www.ebay.com if you’re interested in buying one. Do you know where can I get the MG-880 or other models mentioned in your article? I really missed the game. Do you stock them and do you ship to New Zealand .. or do you know of an agent in NZ who sells them? I do stock them, and do ship to NZ; unfortunately am all out having just sold the last few, but will be in touch when/if a new lot arrives. Hi, I’d like details on the model MG880 calculator including price. No problem, as soon as it arrives and I’ve checked it over I’ll be in touch. Hi can you help me find MG880 calculator to buy, thank you. Hi there I am looking to purchase a mg880 do you have one or can you source one? Will do 🙂 – I’ve got a nice MG-770 if you’re interested? cheers. Looking for a Casio MG-880, please help to find one and let me know the cost. Hi thre, looking to purchase a Casio MG-880 for xmas. Any chance of having in stock then? Please contact me with updates. Hi there, stocks of the MG-880 have become scarcer than ever of late and unfortunately this means the prices have been skyrocketing (USD300+). Any I can source for a reasonable price I will list on here, but the prices are becoming a little outlandish. Hi I am looking for Casio MG-880, MG-775 and a BG-15. Can you still get these and how much are they? Hi, wondering if you have any in stock yet (MG – 880) and how much? Sorry, they are becoming very hard to find at the moment but will list any I have for sale here if/when I can source some more. Any mg880 s in stock yet please ?? So as of Apr 19th, 2013 do you have two for sale? Or is that out of date? Hi,any mg 880s for sale. There are – did you not get my email? no i did not get it,do you have one with a case or are those two out of date.regards anthony. Hi again,I see you have one for sale with case and instructions,is that correct.regards anthony. Hi, sorry for the delay in replying. I was waiting for your email reply. Would you still have this? I’m am interested in a Casio MG-880 as well if/when one becomes available please contact me. Will do, I’ll hopefully have one later this month. That photo really looks like it’s taken from a place at the top of Dominion Road. I found an excellent android version of this game on Google Play. Works just like the original. Search for Digital Invaders by PY Labs. HI,do you still sell MG880? Hi, I may have an MG-880 for sale soon; I will email you when it is available. would love to know when you can get them. Also thank you for the person who put the android version of this game on Google Play. Works just like the original. Search for Digital Invaders by PY Labs. I’ll hopefully have at least one for sale in the next week or so; the last couple I’ve received have been irrepairable unfortunately. Hi, I am looking for MG-880. May I know if you have any stock available? Hi, I wish to purchase a Casio MG-880, please can you tell me if you have any in stock and what price range you would be looking for? Hi there, I’ve got one with it’s plastic wallet, fully working for USD150 shipped worldwide. 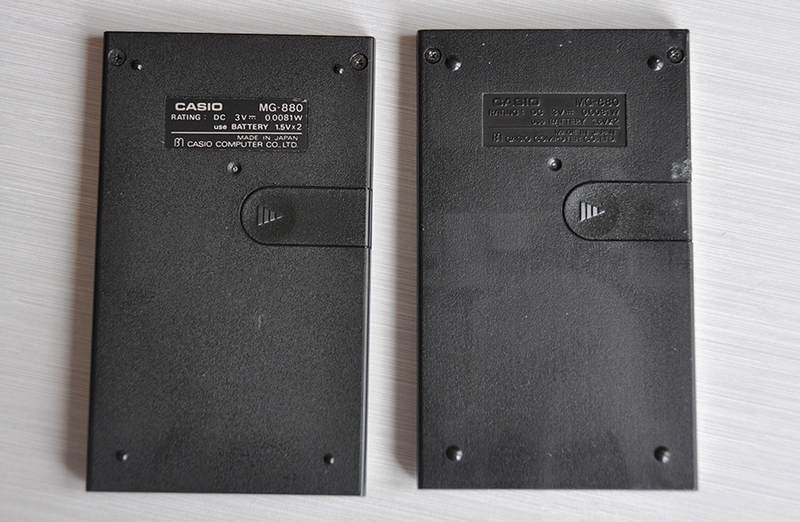 Hi, I do have a couple of MG-880s for sale at present; used but fully working, with plastic cases. USD200 including shipping worldwide. Hi, I wish to purchase a Casio MG-880, please can you tell me if you have any in stock and what price range you would be looking for(including shipping to Singapore? I am living in Singapore. Hi, I currently have a couple for sale, USD200 shipped worldwide. Fire me a message via the contact form if interested, thanks! I had one of the mg 880 casios in the 80’s and I would love to own one again – can you get hold of any more ? Hi Gwyn, I’ll see what I have (some hunting through boxes is required) and let you know. Hi. Do you still have the MG880 available? Would love to purchase. Hi Zanna, I’ll see what I have (some hunting through boxes is required) and let you know. Hi Emma, I currently have a couple of these for sale, used but fully-working, with plastic cases. USD200 including shipping worldwide. Hi, I have a couple for sale, USD200 posted worldwide. Fire me a message via the contact form if interested, thanks! Hi Christian, the MG-880 takes 2x 389 batteries (also known as LR1130, AG10, SR1130W). They are pretty common and available from either a Dollar Store for cheapies (don’t leave these in the calculator for long periods) or go for a Renata, Energizer, Maxell etc from a watchmaker/jeweller. Sure do; they’re USD200 posted worldwide. Cheaper if you’re in NZ/AUS due to cheaper postage costs. Fire me a message via the contact form if interested, thanks! Pls let me know if anyone still have available stock for this casio mg880 calculator…..residing in Singapore. Hi, I do have a few MG-880s at the moment. They are all second-hand but are working, and have the plastic case (although the plastic cases aren’t in great condition). Price, including post, USD200 worldwide. Sure do; USD200 posted anywhere in the world. Cheaper if you’re in NZ/AUS due to cheaper postage charges. Fire me a message through the contact form if you’re interested. Hi, yes a couple for sale, USD200 shipped worldwide. Fire me a message via the contact form if interested, thanks! Hi, how much will it be if collection in Auckland? Hi, an MG-880 posted to Wellington is USD170. If you’re interested, please get in touch via the Contact link at the top of the page — thanks! Hi Can I please order a mg 88 casio calculator a friend found one the other day now I really want one . Hi, the MG-880s are USD200 including postage worldwide. If you are interested, please send an email via the contact link at the top of the page — thanks! Hi Ems, yes – USD200 including post to anywhere in the world. Cheaper if you’re in NZ or AUS. I could do AUD165 delivered — assuming you are actually in Australia (it’s the postage that’s the killer outside Australasia). I do have been hunting for one of these can you locate one please. Yep – sent you an email. I also want to have one, pls asisist tks! Cool; send me your details via the contact page, also where you are in the world and I’ll let you know the price. My MG 880 LCD is gone. Do you have parts ? Hi, I do have a few LCDs but your bigger problem is going to be replacing it. The ribbon cable between the LCD and circuitboard is made of paper and adhesive tape with lines of conductive ink on it. Remove this and you’ll probably never get it to stick properly again – even if you’re really careful (and accurate) you’ll probably end up with segments missing all over the place. I’ve been hoping someone would come up with a replacement for these but so far, nothing… Potentially your LCD is fine, it’s just the cable (or possibly the polarising filter on top of it) that’s degraded. Yep – shoot me an email via the Contact Form with where in the world you are and I’ll let you know the price including postage. Hi there do you have any MG880 calculators available and if so how much would it cost and send to Whanganui N.Z. Yep, I’ve send you an email.